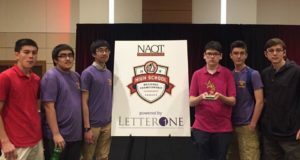 The Troy High School MasterMinds Quiz bowl Team competed in the National Academic Quiz Tournament in Atlanta, GA over Memorial Day Weekend. The team was ranked #77 out of 352 competing teams – a great finish for a first-time participant in this caliber of competition. The team participated in 12 matches, with seven wins and five losses. They advanced to the playoffs Sunday afternoon before being eliminated in the second round. On individual, Troy High junior Alex Pyle, was ranked #14 out of 1,664 competitors. He received an all-star trophy for his achievement. Thank you to the Troy CSD community for your support!